“The Harmonious Thuringian.” J.S. BACH: Toccata in E minor, BWV 914; Fantasia in G minor, BWV 917; Prelude in A major, BWV 896. Johann Caspar Ferdinand FISCHER: Suite VIII in G major. Louis MARCHAND: Prelude in D minor. Johann Philipp KRIEGER: Passacaglia in D minor. Johann KRIEGER: Ich dich hab ich gehoffet Herr. Christian RITTER: Allemande in descessum Caroli xi Regis Sveciae. Johann Christoph BACH: Prelude and Fugue in E-flat major. Johann PACHELBEL (Attr. ): Fugue in C major. Tarquinio MERULA: Capriccio Cromatico. Friedrich Wilhelm ZACHOW: Nun komm, der Heiden Heiland. Johann KUHNAU: Prelude. George Frideric HANDEL: Suite No. 5 in E major, HWV 430. Terence Charlston (hpsi). Divine Art DDA 25122 (1 CD) (http://www.divineartrecords.com/). This profoundly satisfying program started with the instrument. To match this 2010 David Evans copy of an anonymous circa 1715 Thuringian harpsichord, Charlston presents music from Bach and Handel’s early years, including pieces which they themselves may have studied. The Fischer and Marchand were copied by Bach’s older brother Johann Christoph. Zachow was one of Handel’s teachers. It is deceptive to listen to this music and to slot composers and works into geo-political buckets. There is not much distance between, for example, Marchand’s Prelude and J.P. Krieger’s Passacaglia. 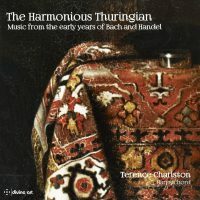 Charlston proceeds with bright energy, adjusting timbres (Kuhnau’s short Prelude is taken with the lute stop) and reveling in the music’s inventiveness (Fischer’s Chaconne hides a sunny twist). The Handel Suite anchors the release, and Charlston enlivens it, setting it apart from most other Handel I’ve heard (and consequently forgotten). Exceptionally detailed and informative notes. 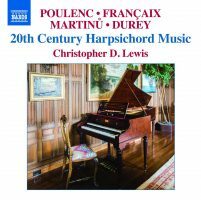 “20th Century Harpsichord Music.” Francis POULENC: Suite française, FP 80b (1935). Jean FRANÇAIX: Deux Pièces pour clavecin (1977). Bohuslav MARTINŮ: Deux Impromptus, H. 381 (1959); Sonate pour clavecin, H. 368 (1958); Deux Pièces pour clavecin, H. 244 (1935). Louis DUREY: Dix Inventions, Op. 41 (1924-27). Christopher D. Lewis (hpsi). Naxos 8.573364 (1 CD) (http://www.naxos.com/). Vincent PERSICHETTI: Harpsichord Sonata No. 1, Op. 52 (1951); Harpsichord Sonata No. 3, Op. 149 (1983); Harpsichord Sonata No. 5, Op. 152 (1984); Harpsichord Sonata No. 8, Op. 158 (1987); Harpsichord Sonata No. 9, Op. 163 (1987); Serenade No. 15, Op. 161 (1987). Christopher D. Lewis (hpsi). Naxos 8.559843 (1 CD) (http://www.naxos.com/). This ca. 1930 Pleyel’s strident and zippy sound, like a rat teething on bridge wires, takes some getting used to. However, the instrument, akin to what Landowska popularized, fits Lewis’ repertoire. Poulenc’s Suite, originally for winds, percussion and harpsichord, is modeled on the music of Claude Gervaise, and seems to be built from 16th-century tunes. Françaix’s two, a brief Grave and a shorter Vivace, are vignettes. These Martinů items lack their composer’s characteristic polytonal harmonic pivots. The Sonata is comedic, and the two Impromptus are regal with undeveloped humor. Both were written for Antoinette Vischer. The concluding pair is a slow-fast couple. Durey’s terse Inventions, keyboard arrangements of music originally scored for diverse instrumental pairs, are modeled on Bach, but atonal. After several acclimatizing passes, it becomes evident that the Pleyel blunts nuances. No fault to Lewis, but there may be more to these pieces than can be heard here. 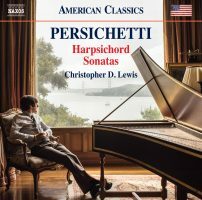 Short and restless, Persichetti’s harpsichord sonatas aptly characterize his own assessment, that his music alternates between gracious and gritty. Lewis offers Nos. 1, 3 and 5 on the same Pleyel used in the recital (Naxos 8.573364). It’s hard not to smile at No. 3’s goofy and jazzy opening Allegro, or the lightly sour canonic imitation in No. 5. The Eighth, Ninth and Serenade are offered on a Ruckers copy made by Kevin Fryer in 1997; they come off as more expressive and mature. The fast-slow-fast format affords ample opportunities for variety and exploring the instruments’ colors (damper, doubling, etc.). Despite concise movements, Persichetti squeezes in subtle variations. It’s evident the composer took a gander at older models to understand form and the keyboard’s capabilities. “Overture to Orpheus.” Bohuslav MARTINŮ: Deux Impromptus, H. 381 (1959). Edwin McLEAN: Sonata No. 2 (1996). Louis ANDRIESSEN: Overture to Orpheus (1981-82). Alexander VOORMOLEN: Suite de Clavecin (1921). Albert GLINSKY: Sunbow (1983). Lou HARRISON: 6 Sonatas (1943). Daniel PINKHAM: Homage à Wanda (1959). Michael NYMAN: Tango for Tim (1994). Elaine Funaro (hpsi). Centaur Records CRC 2517 (1 CD) (http://www.centaurrecords.com/). “Dances with Harpsichords.” Herbert HOWELLS: Three Pieces from Lambert’s Clavichord, Op. 41 (1927). Kent HOLLIDAY: Dances from Colca Canyon (1999). Dimitri CERVO: Pequena Suite Brasileira (1999). Stephen DODGSON: Tambourin from Suite No. 1 (1967). Timothy TIKKER: Three Bulgarian Dances (1999). Timothy BROWN: Suite Española (1999). Francis THOMÉ: Rigadon (1892). Rudy DAVENPORT: Seven Innocent Dances (1996). Sondra CLARK: Three Odd Meters (1999). Sally MOSHER: Bossa Nova (1997); Downtown Swagger Rag (1997). Stephen YATES: Fandangle Indeed (1994). Elaine Funaro (hpsi). Centaur CRC 2651 (1 CD) (http://www.centaurrecords.com/). 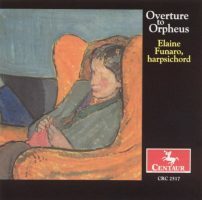 The theme uniting Funaro’s “Overture to Orpheus” is that all the pieces were written for women. As much as I crave the idea of an 11-minute Andriessen piece for solo harpsichord, the repetition is trying, and the piece never lifts off. Similarly, the Nyman with compound rhythms, lumbers like a peg-legged pirate’s tango. Beyond these more familiar names, the most durable discovery is Voormolen. The oldest piece here, Voormolen’s 1921 Suite finely embroiders jazz and Ravel, though less erudite than the French master. Another piece that attempts to bridge styles is McLean’s brief Sonata, indebted to 20th-century pop music. Glinsky’s Sunbow is a vigorous exploration of the keyboard’s colors. Harrison’s Sonatas are short, on the Scarlatti scale, some exploring ersatz gamelan modes and patterns. Funaro appears to seek out and collect the arcane: The bittiest piece is Pinkham’s 20-second postcard-sized Homage à Wanda. Funaro plays a robust William Dowd copy of a Taskin from 1976 and a “Northern European Eclectic” by Richard Kingston from 1985. 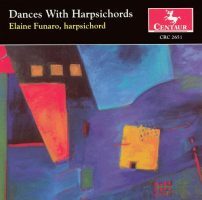 Funaro’s lively “Dances with Harpsichords” explores 37 works from 11 composers. Except for Yates’ chaconne-like fandango whose variations grow in depth, these are predominantly brief character pieces. Among the modern efforts, ethnic dances are prevalent: Holliday’s Dances refer to Peru, Cervo’s are Brazilian, Tikker’s are Bulgarian, and Brown’s are Spanish. Mosher’s Downtown Swagger Rag would make an excellent hair-loosening encore in a more staid recital. Scant music was written for harpsichord in the 19th century. Funaro notes that Thomé’s Rigadon (commissioned by Louis Diémer, who performed French Baroque music on a restored Taskin) appeared at the start of the instrument’s resurgence. With its ornaments and trills, Rigadon is this program’s most antique-sounding item, suggesting Thomé knew his French models. Curiously, the oldest pieces suggest times well before their composition: Howells’ three (from a full dozen worth seeking out) reach back to Dowland, and Dodgson’s Tambourin to 18th-century France. Each of Davenport’s momentary Innocents represents a characteristic hard to spy: casualness, resolve, playfulness, excitement, fire, pomposity and steadiness. Clark’s Three Odd Meters also exists in other arrangements, for chorus, wind quintet, and two pianos. Here the dances are idiomatic, especially the central Pentatempo Waltz with five beats to the measure. Funaro alternates two harpsichords: the Dowd Taskin copy and a 1984 Flemish double by Joop Klinkhamer.